A Day Dreamer's World: Bookshops I Want To Visit! Bookshops I Want To Visit! For the past few hours, I've browsed lists of bookshops that every reader needs to visit in their lifetime, reading about those that are based in the likes of renovated train stations and museums. Before reading articles on different sites about how many miles of shelving bookstores in New York have, I had a small list of those I wanted to visit, including Watestones Piccadilly that, after multiple visits to London, I still haven't seen! I have, over the past few years, fallen in love with New York City. There's the Statue of Liberty, the Empire State Building and Times Square, all of which I want to visit with my guidebook in hand. But, it's also home to the Library Hotel, the New York Public Library and, annually, Book Expo America(BEA). Within a few substation stops, you have all a booklover would ever need. World famous bookstores line the streets, including Strand Book Store, housing rare collections and second hand books with yellowing-pages. Whilst searching the website, I discovered that the bookstore has eighteen miles of book shelving; an amount that I can't comprehend. Maths is not a skill of mine, but - at an estimate - this would be my walk home from school, but around nineteen times over. Just from the outside, with its red sign, The Strand appears to be so welcoming; set on the corner of a busy New York street where yellow cabs are passing every few minutes. When I visited Hay-on-Wye - named 'the town of books' - I loved admiring the leather-bound, hand-written books, mainly because it became a competition to find the most expensive book available. I think I would have a similar experience in the Strand! Although it's not a bookstore, the Library Hotel NYC has been a place I've wanted to stay at for a while now, all of the rooms decorated with stacked-shelves. Who wouldn't want to wake up at the Library Hotel, then head over to the Convention Centre for BEA, only to pause at a Barnes and Noble on the way back? 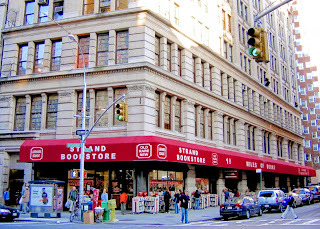 Or maybe head to The Strand? Sadly, I'm going to have to wait a few years before visiting the Strand. But, Waterstones Piccadilly is a much more realistic goal, as I love visiting London; somehow, when I've walked through Piccadilly, I've missed the eight-storey bookshop. Every week, news of events at the store gather on my Twitter feed, most recently authors Maureen Johnson, Sarah Rees Brennan, James Dawson, David Levithan and Rainbow Rowell. have made an appearance there. I'd love to be able to make it to an event at the store, as they are constantly championing YA novels, and I've seen numerous pictures of their colourful displays inside and out. And, after reading about the shop on other blogs, I've heard nothing but praise for it's teen section. I'm just waiting for the time I can spend hours browsing the shelves without worrying about having a train to catch! Maybe I'll manage to do this and stay the night instead? This bookstore is beautiful. 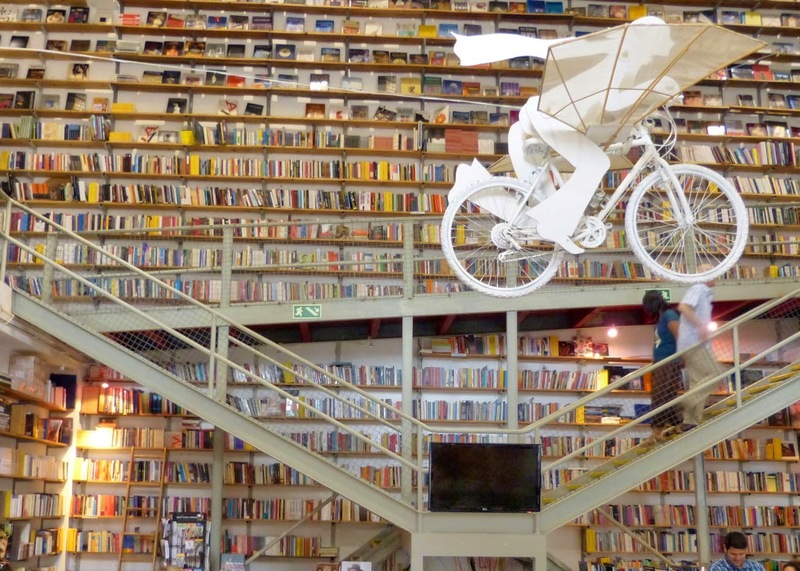 Pictures of the building, with a bicycle hanging from the ceiling and stacks of multi-coloured books covering the walls, were on most lists of must-visit bookshops when I was reading them. Ler Devager is storeys high, a difference to my local bookshops which - at most - have two(one holding the books, another with a café). Whilst I was able to gather facts about the other stores above with ease, this bookshop proved to be a more difficult task, its website written in a foreign language(Spanish, perhaps?). I, though, adore bookshops like Ler Devagar, as they make people - especially those who may not necessarily like to read - excited about reading. I know I wouldn't be able to walk into such a shop without feeling overwhelmed; or without running up the multiple flights of stairs to the fiction section. Another bookstore I continue to come across is the Poplar Kid's Republic Bookstore in Beijing,. There are reading nooks designed in a wide selection of shapes, rainbow-coloured carpets and different rooms to read in. I wish there had been a bookstore - or library - this interesting to visit when I first began to enjoy reading. It would have made my reading experience much more vivid. I saw a picture of this bookstore and sat admiring it for a few minutes before reading the information beneath it. Once, I walked into a bookshop that was a converted cinema, and was really impressed, loving how the stars were still painted on the top floor ceiling. Hundreds of shelved books in a theatre, though, is even better. Having been voted one of the most beautiful bookstores in the world, I have no worries that this isn't as impressive when you walk through the doors. I'd adore browsing the shelves in the stands, looking down on the stage below, where the seating area is filled with yet more books. It's a gorgeous setting for a bookstore, with a vintage-feel that makes me want to sit on the stage and read a Jane Austen novel. So, what bookshops would you like to visit? *Images used in this post are not my own but, have been re-sized to fit with the format of my post. Same here! I think they're the definition of a booklover's dream. Oooh love this post! Have you heard of, Shakespeare and Company in Paris? That's one book store that I always had a dream of visiting and was lucky enough to buy two books from their when I went to Paris a few months ago! Thank you! I came across it when I was doing some research for this post and it looked gorgeous! I can't help but admit that I'm a little bit jealous of your trip there! Waterstones Piccadilly is brilliant! Definitely worth a trip. Have you visited Foyles? I love it there so much! I haven't! I've been wanting to for a while now but, just haven't had the chance! Definitely a place I will try to visit the next time in London! Eek! You have to pop in the next time you're there and share some pictures! I'd love that - it's probably better than just admiring the single photo above! Shakespeare & Co seems to be a really popular one on wishlists! It looks gorgeous!